It was supposed to be an in and out mission. Quick landing, some photos and away should we go. But no one warned us, that there will not only other contestants, but also a demonic presence called Vul-Kar on the island. At his command the earth is burning with fire and flames are flying around. In search of the best shot, this is not about composition, but about how best to avoid flowing lava. We will be running on the bursting island as well and even though we might get burned, we would also like to thank Restoration Games. This company took as their goal to reinvent the great classics of the eighties and nineties, when board games were still in their infancy. In America, games like Fireball Island were really popular. Its potential for 2018 has been tested by Kickstarter, where nearly $ 3 million (from more than 23,000 players) have been gathered! And while the original version of the 1986 version was made by Chuck Kennedy and Bruce Lund, the new version was edited by popular Rob Daviau. 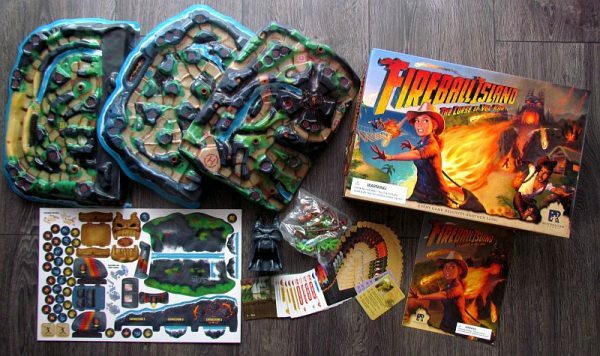 In the big box we see a group of adventurers and behind them the fire head of the island’s master. Box itself could have been made of harder cardboard, but the contents still hold on the spot quite surely. 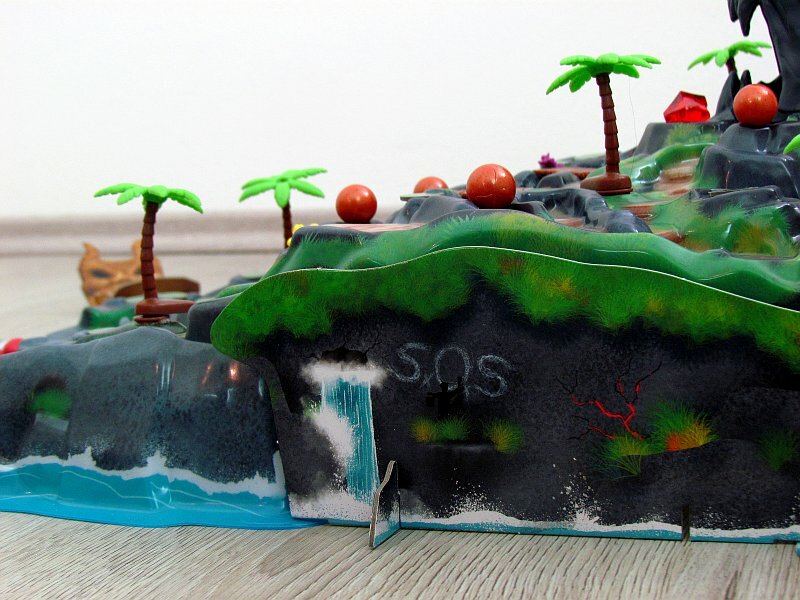 Once you’ve lifted the lid, you’ll find three huge molds forming a spatial model of the island. They all connect together and do the same with a few cardboard components. They will create a helicopter and a maw. At the top of the island, players will build the plastic head of Vul-Kar himself. However, other places are also available on the game board – for plastic rotating trees, round treasure tokens and a few balls. 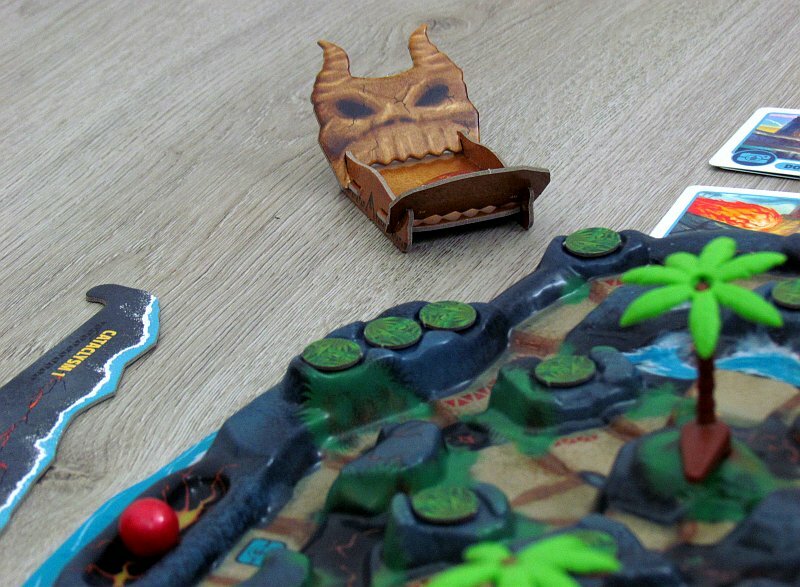 Players need to prepare cataclysm track, that will count down time of the game. This is where the fire balls are placed, ready to burst. There is still a stock of action cards left on the table, as well as piles of available photograph spots. Afterwards, each of the participants chooses his own hero, places his figure on a helicopter pad, but puts a portrait in front of him. To accomplish all his goals, each of the rivals will receive one of the souvenir cards and two action cards, they will be holding secretly in their hand. Just playing the action card is the main focus of every turn. It decides for each hero, above all, above a number of steps, that can his hero move in any direction. 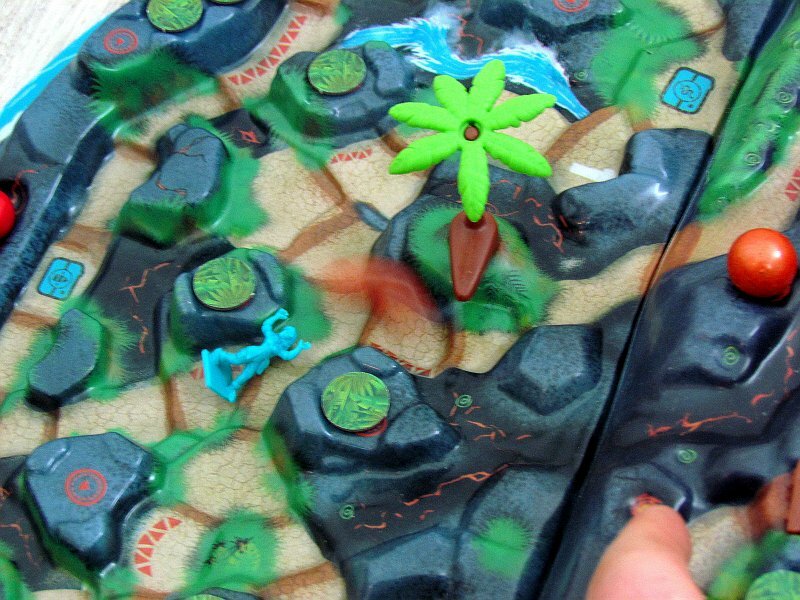 Because ground is hot, adventurers are usually moving on the map usually very fast, even ten steps each turn. As they move around, they can collect treasure tokens nearby and even take one of six available shots (and take a corresponding card). To do all this, hero even does not need to end his move in the box, just pass by. But if this would be all, such a game would not be much about adventure. That’s why, in addition to moving, players can do more thanks to the played card – the first is the chance to turn one of the elements on the map – not just a planted tree, whose root can change the direction of the rolling lava balls, but above all the head of Vul-Kar. 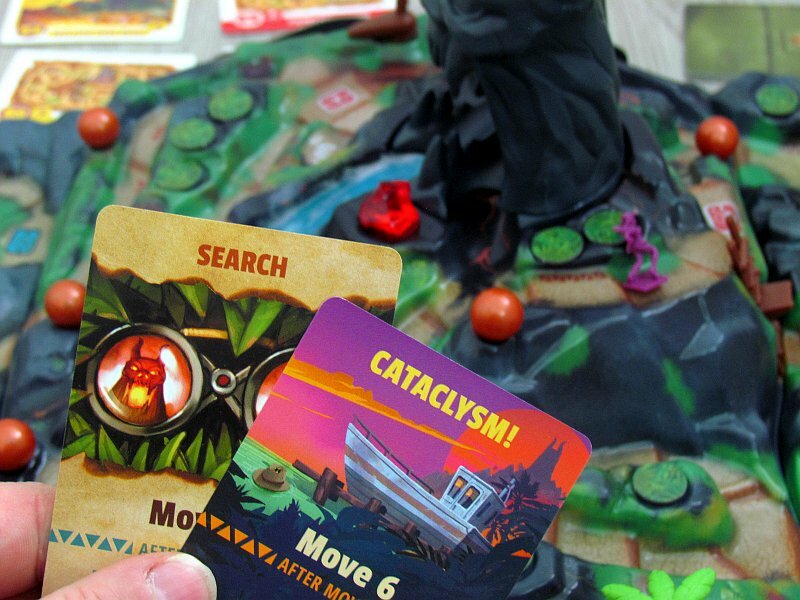 It comes into play, when one of the players plays cataclysm card. 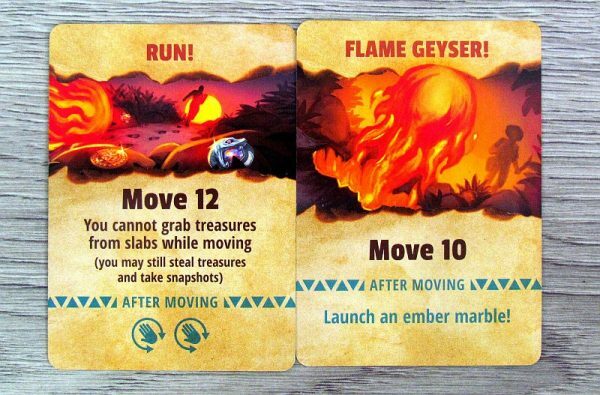 At that point, players can pick up fire balls ready and one after other throw it in the head of Vul-Kar. It can emerge from one of the three possible routes from the muzzle, roll down troughs of the plan and cause a proper gauntlet. 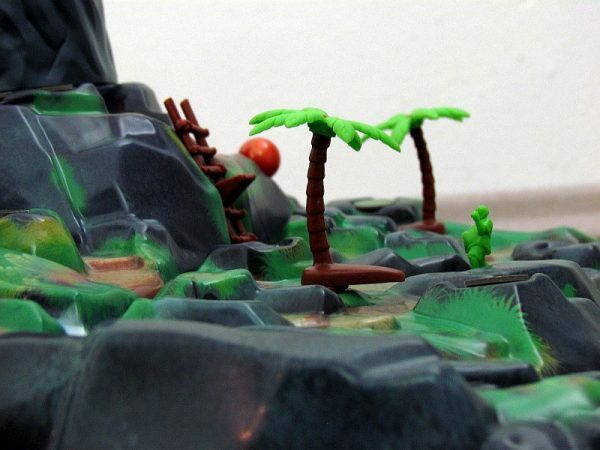 It can knock down miniatures and other elements and move all of them unpredictably on the map. 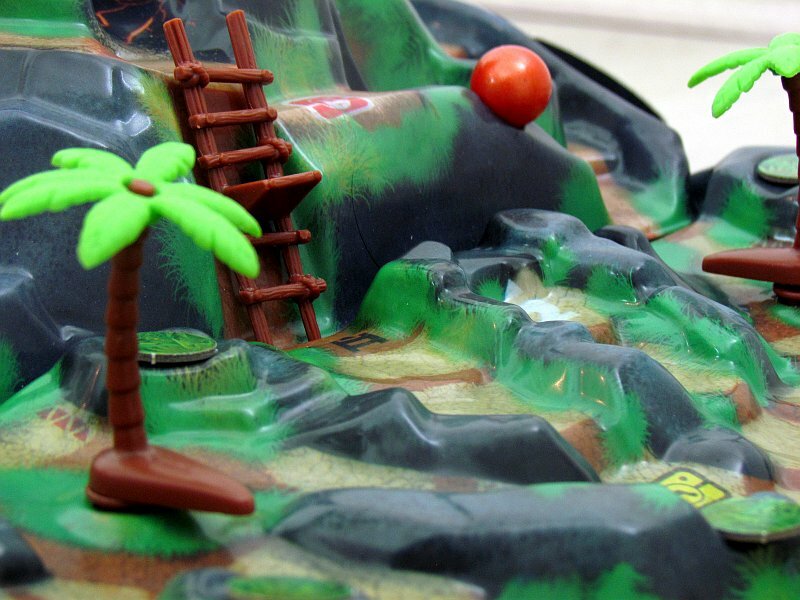 In addition, players can get the chance to flick one of the prepared balls on the map and try to aim and shoot down one of their opponents. After playing a standard card, the player can also take advantage of one special souvenir card – an one-time advantage. Then there is another opponent’s turn. 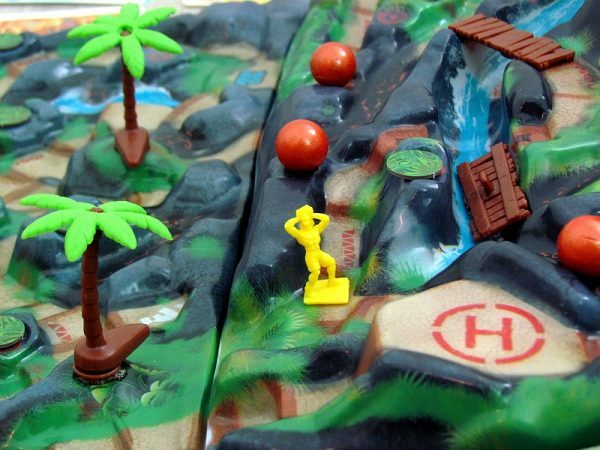 Game then flows forward, with all the heroes running until one of them has managed to get a three photos of the island and run back to the helicopter. 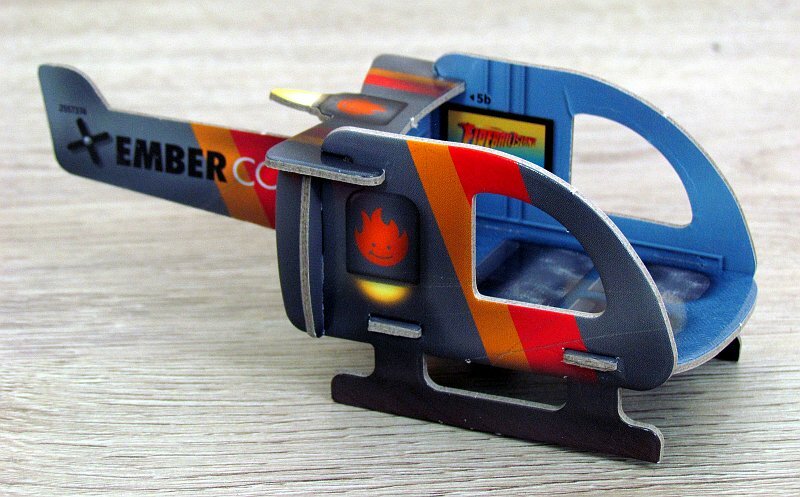 After that, other riders have the last two rounds to try to jump aboard the flying rescue. 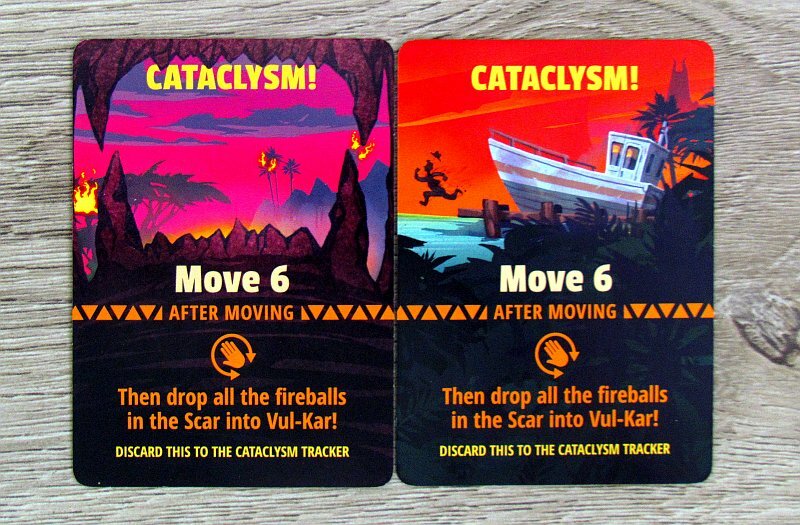 The island’s ruin may occur earlier, if the cataclysm scale is filled three times (= players have played nine cataclysm cards). The island sinks, the helicopter flies and the heroes must try to get on its deck even with an incomplete set of photos. 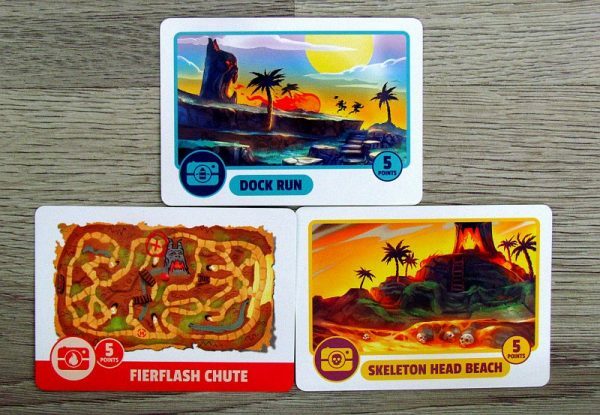 That’s because the points are awarded for all the photos hero holds, but also for sets of treasure tokens, beautiful red heart of Vul-Kar and reward for being the first player on board the helicopter. 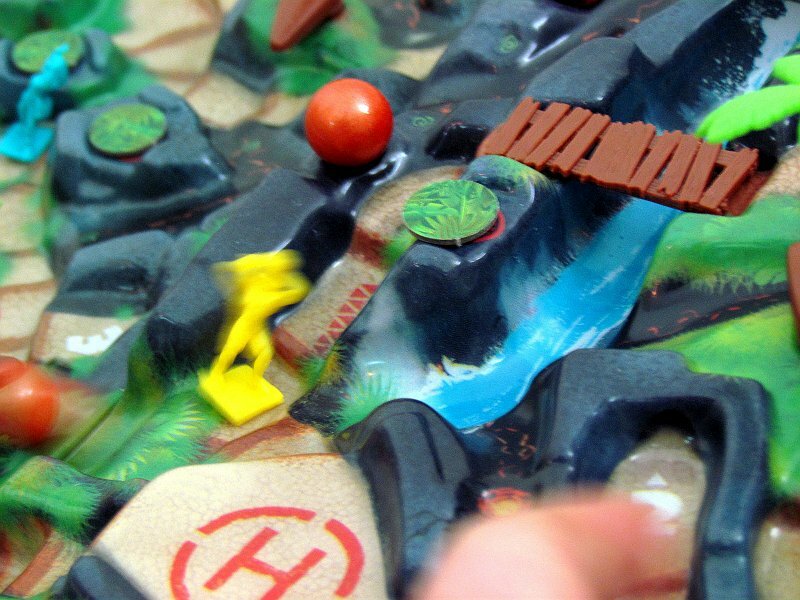 Who has most points in the sum is the winner of the adventure. 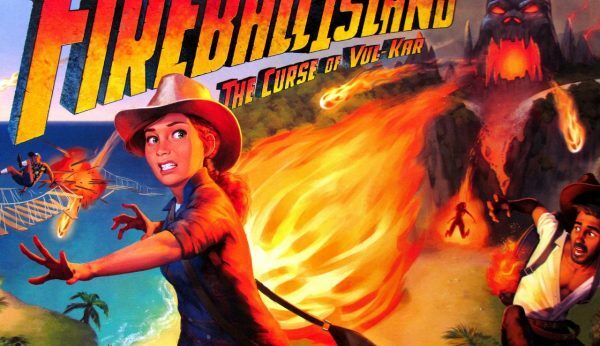 Fireball Island: The Curse of Vul-Kar is a fantastic experience, if you expect a simple and unpredictable adventure. Players have little chance of influencing the performance of their hero. 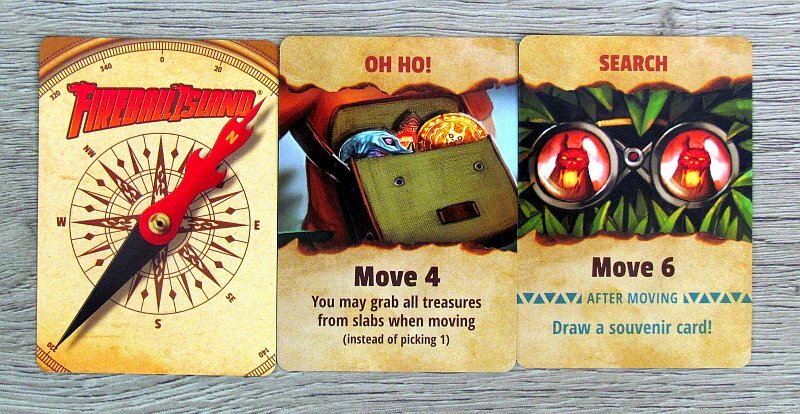 There are always two movement cards in their hand and coincidence decides, which one player draws. So players can feel a little bit of luck. 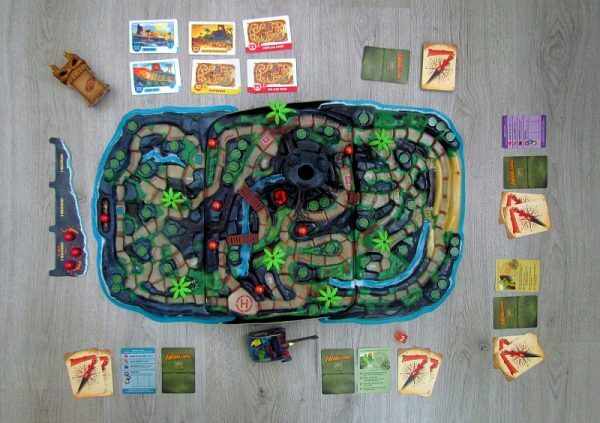 The whole gameplay is absolutely simple and consists of only a few basic rules. 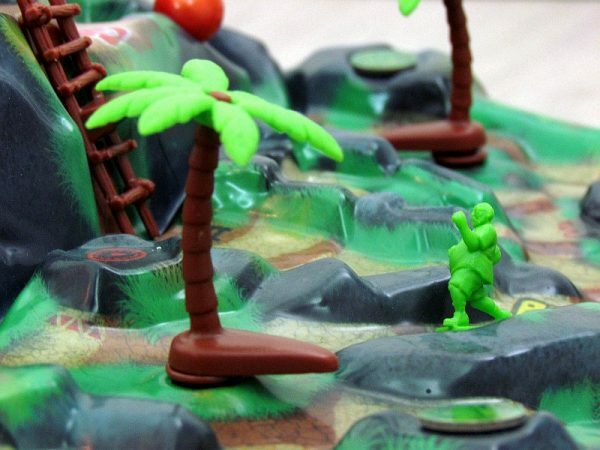 Heroes simply move, collect treasures and try to harm others. Here’s a game, that’s gorgeous, but the final decision is not ultimately on the player. The result of his actions is heavily influenced by chance, so this game does not produce irreconcilable enemies, but in most moments only smiles and laughs. And that’s exactly, what we like to present on a family party. This game has exactly, what parents and kids can look for. 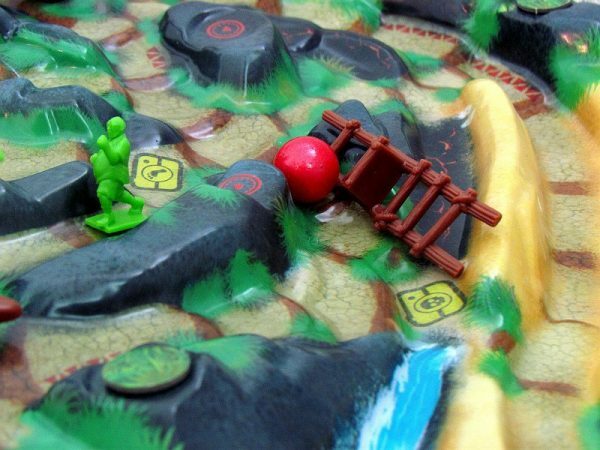 In addition, the area of the island is riddled with obstacles – bridges and ladders, where heroes have to end their movement. 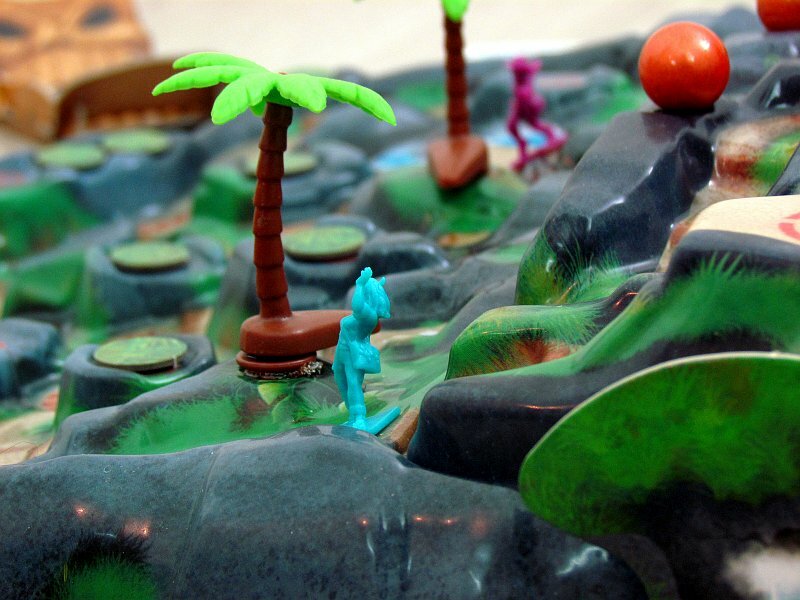 They are standing defenseless against the potential explosion of a volcano. 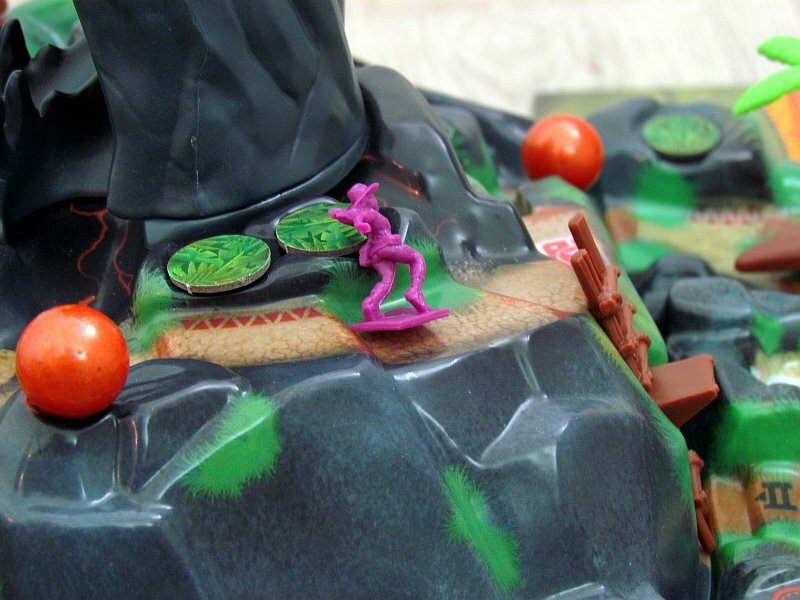 Actual hit of the figurine has no significant negative impact on the player. A successful shooter earns one treasure token as a payoff from the victim. 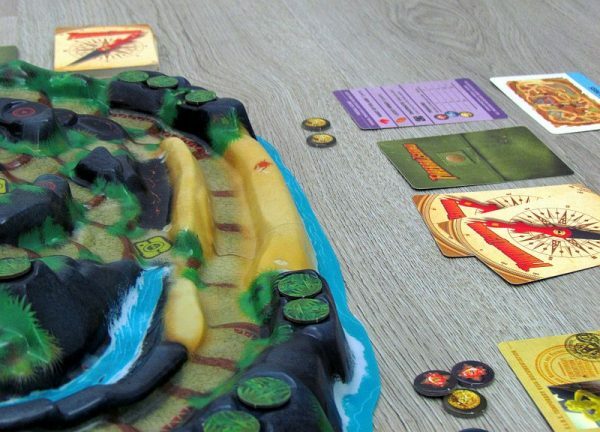 And it can be of high value – the more tokens of some colors player has, the more points (up to fifteen the maximum) he gets. But there are also caves, where players can move faster around the island. But because they do not know the underground corridors well, dice decides for them, where they appear. The game should be great especially in higher numbers. This is why you will be disappointed, that maximum number of participants is limited by figures and cards to four. Still, there is enough chaos on the plan, the players are constantly meeting with each other and there is always room for some action. Especially from the point of view of the heart of Vul-Kar, which is not easy to steal from the main enemy, but even harder to keep – all it takes to lose it is for another hero to pass by and by doing that – steal it. 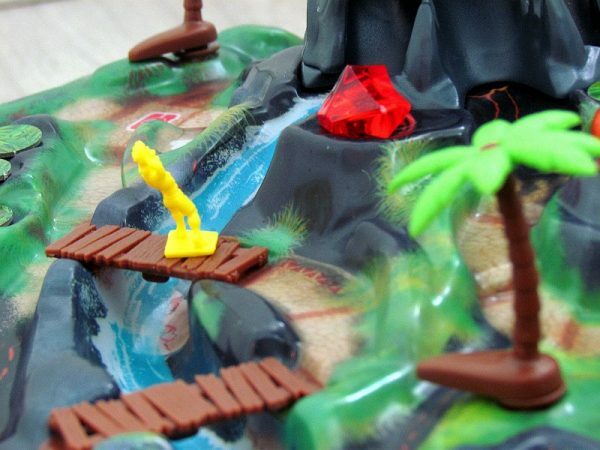 It is a valuable prey, because this diamond gives its owner seven points at the end of the game. And where the top limitation of the number of players will be disappointment, two are not as enjoyable. This is where everyone controls two straight characters and it does not benefit the atmosphere of the adventure, when you have to split your attention among two heroes. Table presence, when you set it up is absolutely fantastic. 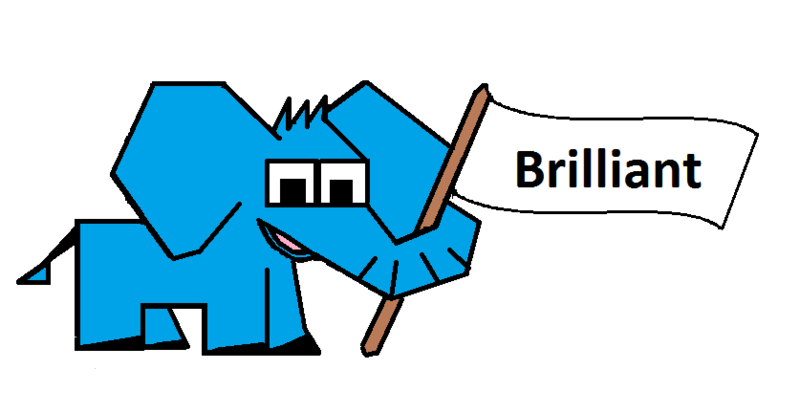 It enchants everyone. But in a paragraph about processing, where should only praise, we need to leave some room for criticism. This refers to miniatures that are – and do not be afraid to say with respect to other components – cheap. Two of our our characters can not even stand properly on a flat surface, which is a crucial issue in the game of heroes. Fireball Island: The Curse of Vul-Kar had the potential to be a hit, and it filled it all the way. 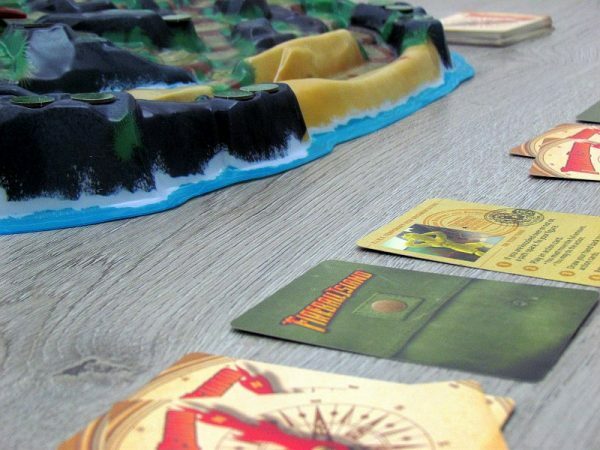 Despite all of the criticisms, we have about the game, it’s all overwhelmingly playable, fun and easy. 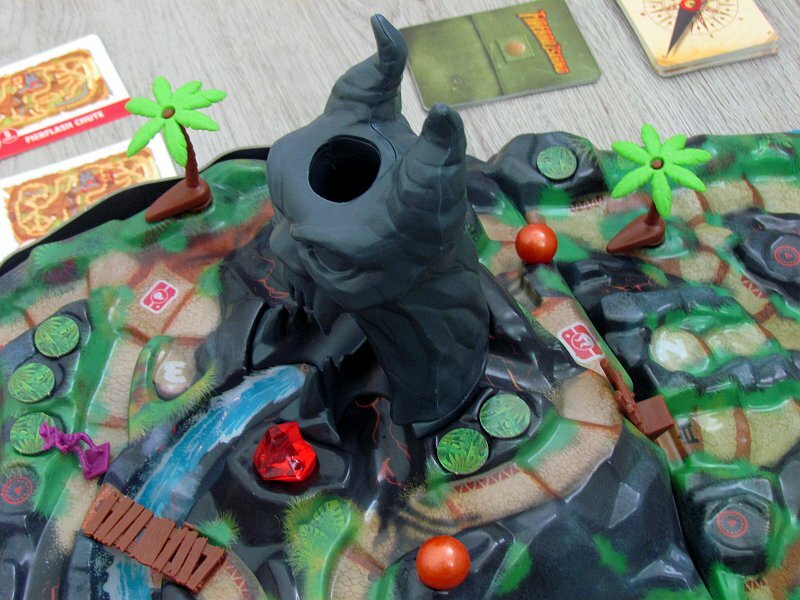 The game lasts for thirty minutes, making it a perfect treat, if you play with at least three players. 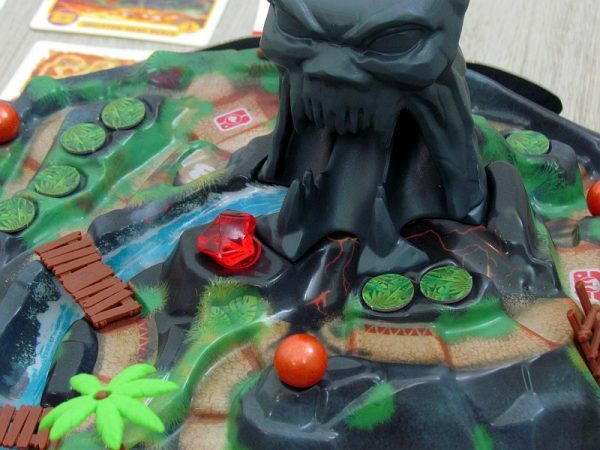 Fireball Island: The Curse of Vul-Kar is the beating heart of board games – embodied by fun. Fireball Island: The Curse of Vul-Kar would, due to its playability, simplicity and speed, deserve a final assessment full of unprecedented admiration and praise. 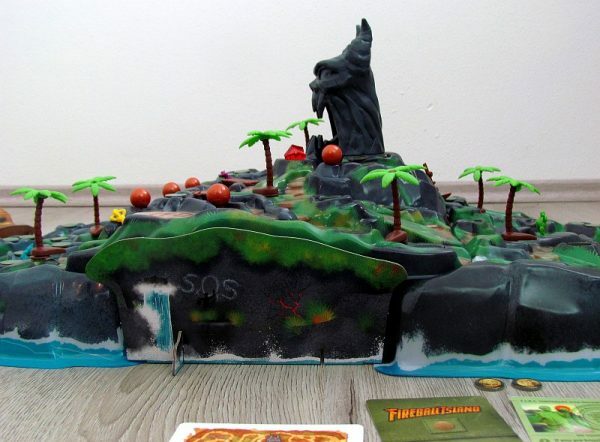 What a pity, that everything is not spoiled by coincidence (you're expecting to have it in such a game) or worse fun in two, but a totally meaningless issue with quality of the miniatures. 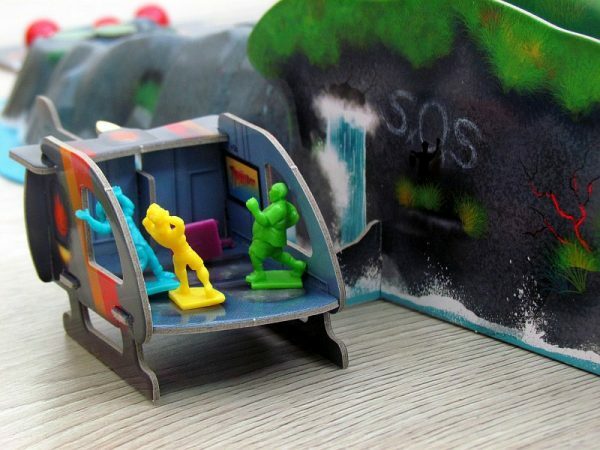 In addition, if you hold a party, you will be disappointed with the maximum number of players. 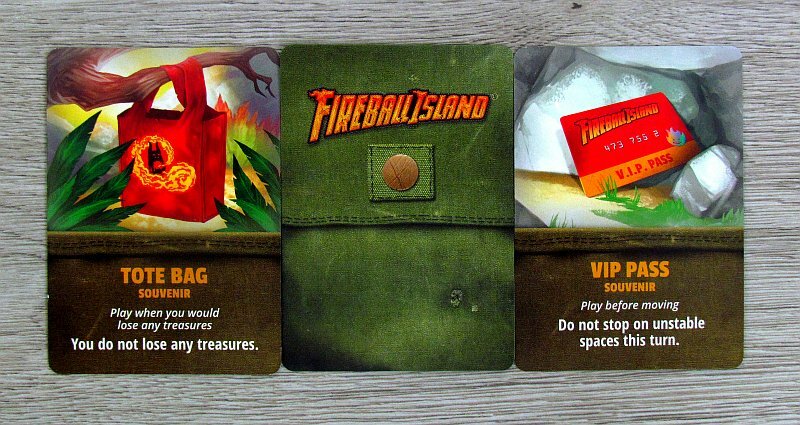 But despite all these problems, we have to recommend Fireball Island to all who like adventure.